The feature is now available with the whatsapp application. But the main thing is that you need to upgrade the application to enjoy the Voice call service from whatsapp. Check for Attitude status for here. Attitude Whatsapp Status (messages,quotes) 2015. First of all you need to uninstall the old whatsapp version which you were using on your smartphone. You should uninstall it and download the New version of whatspp to enable whatsapp. To download it Download Appvn and download the latest version of whatsapp. You can also download an unlimited number of paid apps for free from appvn. Note: Please keep in mind to backup your conversion. Doing this may save your chat history. The Call option look like the below image in the whatsapp. Here i am going to explain the step by step procedure to Enable the voice call feature in whatsapp. So follow according to the steps and enjoy the voice call in whatsapp. First of all you need to Download Whatsapp new version. Download from here. You need download Terminal Emulator. Download from here. Open the Emulator in your android phone. Now type the below code in the Emulator. 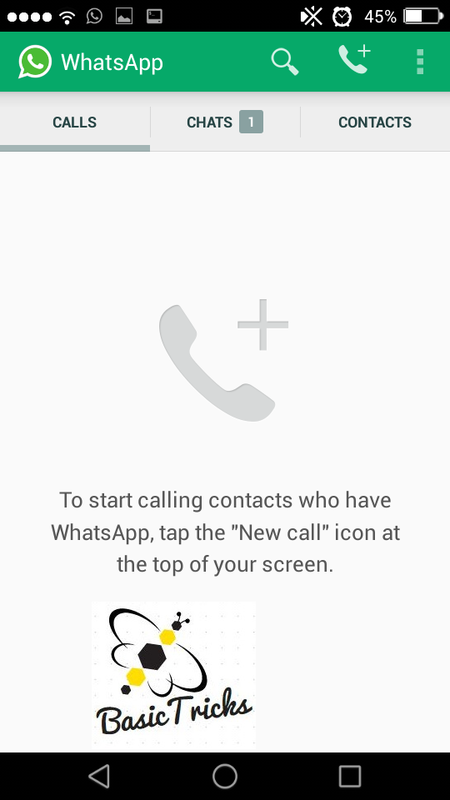 Now whatsapp will open with calling feature enabled. That’s it. You have done!!! If you want to call someone with whatsapp voice call feature , the other person must also have to Enable Calling Feature On Whatsapp in order to receive your call. I hope this tutorial will help you to “ Enable the whatsapp calling feature in your Smartphones“. Don’t miss any tutorials on Basictricks and like us to keep update with us. Feel free to share the your problems with us. we will solve the problems. Mean while share the post in social media. 3 Tips and Tricks to Visualize your Presentation.